Korean Gender Café 한국 젠더 카페: Seoul Event by Hollaback! Korea: Let's put an end to street harassment in our communities! Seoul Event by Hollaback! Korea: Let's put an end to street harassment in our communities! Join Hollaback! Korea in Seoul for a discussion about street harassment and how we can end it. Hollaback! Korea supporters will meet Saturday, February 8 from 2-4PM at Ben James coffee shop near Hapjeong station exit 5. Hollaback Site leaders from Seosan and Seoul will be present and welcome all members to participate in the discussion and/or share their stories for support. Hollaback! Korea supporters will strategize how to end street harassment in our communities. Community members of all genders, sexual orientations, race, and national origin are welcome to join Hollaback! Korea. Hollaback! Korea founders and supporters are friends, daughters, students, sisters and brothers, workers, supporters, partners, wives and husbands who are Korean nationals, people of color, adoptees, foreigners, ethnic and overseas Koreans, LGBTQ, young and old, single and multicultural family members of Korean society. 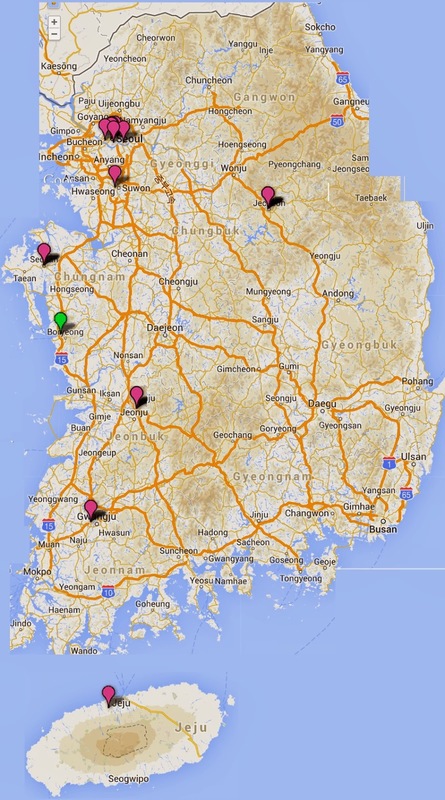 we come from Seoul, Gwangju, Busan, Daejeon, Jeju, and Daegu to share these stories. We are building an intersectional space to address street harassment and welcome anyone to join this movement. This is a map depicting the geographic location of (some of) the stories shared to Hollaback! Korea in the two months since the project launched. See the full map at the Hollaback! Korea website. Pink dots visually depict stories shared by the person targeted for harassment, green dots are stories shared by a bystander who witnessed harassment.